Welcome to the Pecten Resource Web Page! This is the prototype of a web site that will provide information on the diversity, taxonomy, and evolution of scallops in the family Pectinidae as well as links to other useful sites about scallops. The Pecten Resource Web Page will also be the primary site for posting results of phylogenetic analyses of the Pectinidae conducted in the lab of Dr. Jeanne Serb at Iowa State University. 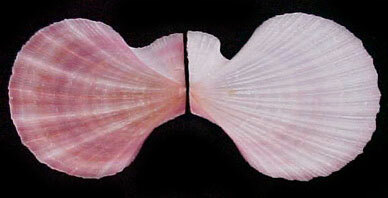 Chlamys hastata, a scallop species that attaches to substrates with a byssus. Copyright © 2006, Iowa State University, all rights reserved.